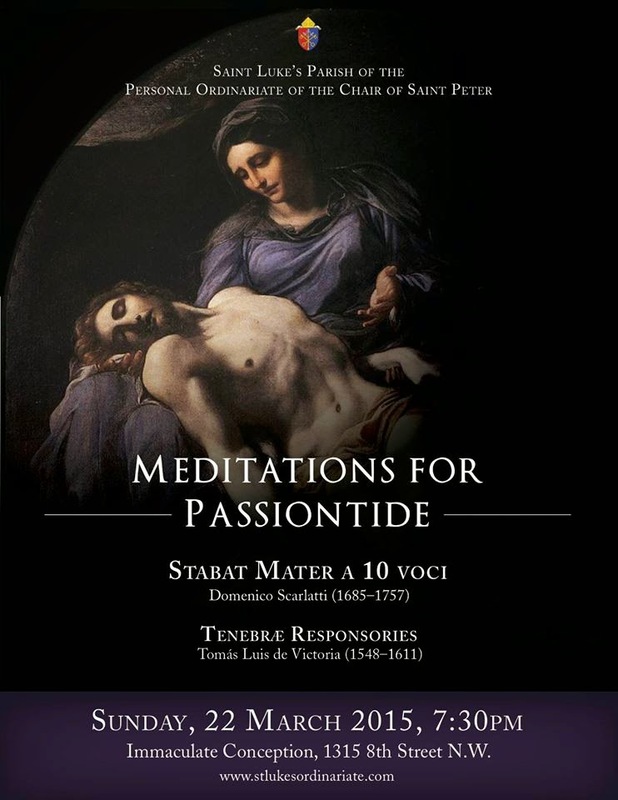 The Washington, D.C. Parish of the Personal Ordinariate of the Chair of Saint Peter is offering an evening of meditations for Passiontide on Sunday, 22 March 2015, at 7.30 p.m. The choir of Saint Luke’s, which sings a weekly Mass on Sundays at 8.30 a.m. at Immaculate Conception, 8th St NW, will perform a selection from Tomás Luis de Victoria’s responsories for Tenebræ, and Domenico Scarlatti’s exquisite 10 voice setting of the Stabat Mater, the hymn traditionally sung during the Stations of the Cross. The music will be accompanied by short preached meditations on the Seven Sorrows of the Blessed Virgin Mary, interspersing the movements of Scarlatti’s work performed by the professional musicians who provide music for worship on a weekly basis.